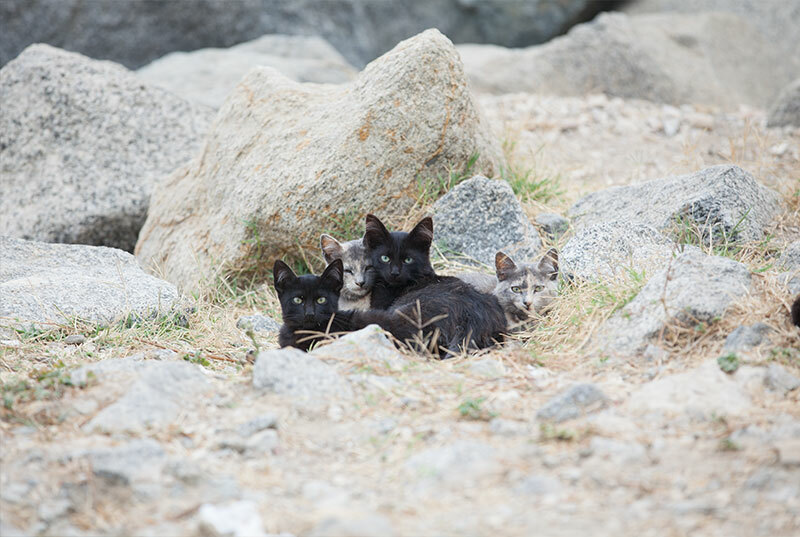 Like dogs and small children, cats who are let outdoors without supervision are vulnerable to the dangers of cars, other animals, cruel people, and diseases. (In addition to a dramatically lowered life expectancy, there is an increased risk of disease.) Feline leukemia, feline AIDS (FIV), feline infectious peritonitis (FIP), toxoplasmosis, distemper, heartworm, and rabies can be difficult to detect and, in the case of FIP and distemper, impossible to test for. They are also highly contagious and can easily be passed on to other companion animals. Fortunately, cats can live happy lives indoors, and they can be given opportunities to explore the outdoors under supervision. Like dogs, cats should be allowed outdoors for walks on leashes that are attached to harnesses and to explore securely fenced yards. A product called Cat Fence-In, a flexible mesh barrier that can be placed on top of privacy fences to prevent cats from climbing out, can help you keep your feline companions safe in your yard.